D’Agostini, D, Bastos, A. C., Amado-Filho, G. M., Vilela, C. G., Oliveira, T. C. S., Webster, J. M., Moura, R. L., 2019. 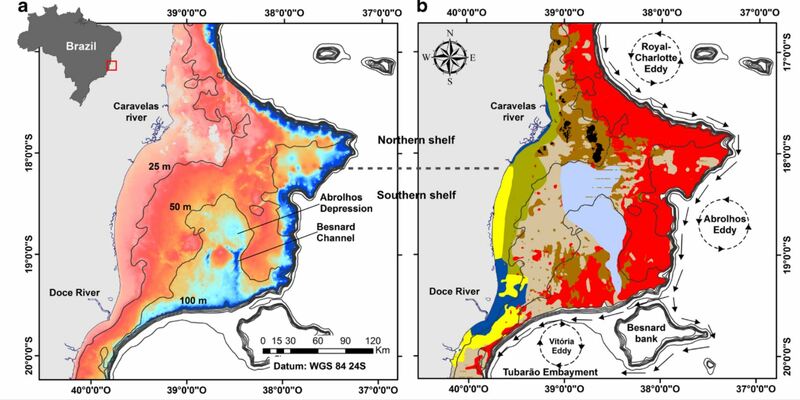 Morphology and Sedimentology of the Shelf-Upper Slope Transition in the Abrolhos Continental Shelf (East Brazilian margin) Geo-Marine Letters., 10.1007/s00367-019-00562-6. 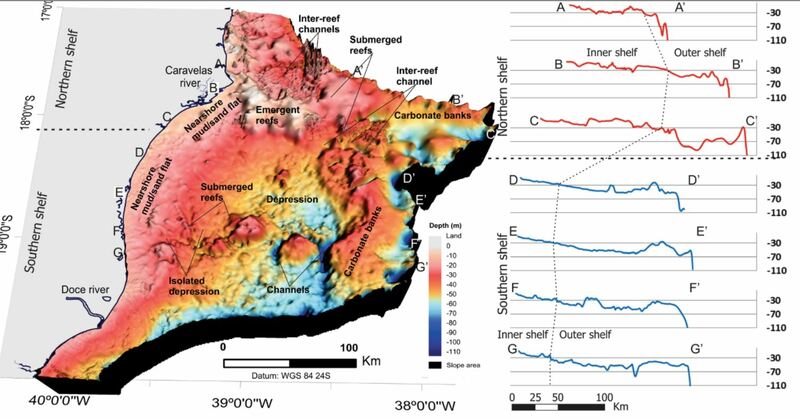 For the first time, this work investigates the contrasting depositional and geomorphological patterns in the Abrolhos shelf-slope system, eastern Brazilian margin, South Atlantic. We have combined existing bathymetric datasets with bottom imagery and samples collected at the Johnson-Sea-Link manned submersible along two Abrolhos slope sites, which are separated by almost 2° of latitude. The dataset includes seafloor sediments, single-beam echosounder, and 20 h of video recording. Dives ranged from 90 to 620 m water depth. 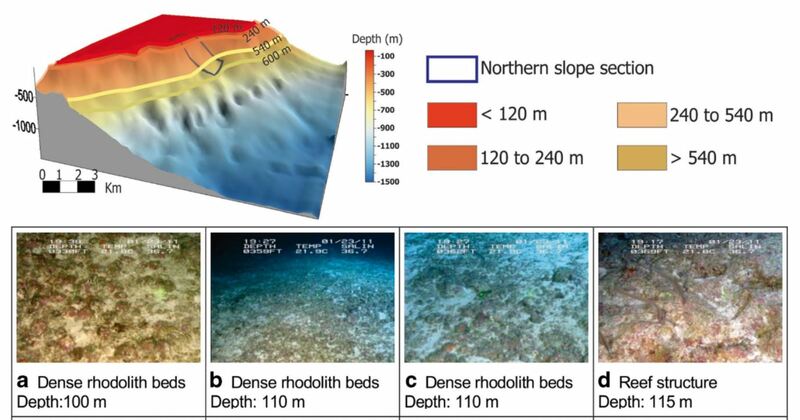 Results showed that the north and south Abrolhos shelf-slope systems are distinct in terms of their morphology and sedimentology. The depositional pattern in the northern upper slope is more typical of carbonate dominated system, while the southern slope characterised by a more gentle gradient is consistent with the dominance of siliciclastic sedimentation. The study is part of a wonderful, ongoing collaboration between the GRG and Associate Professor Alex Basto’s marine geology & geophysics group (Laboratório de Oceanografia Geológica – LaboGeo) at Universidade Federal do Espírito Santo, Vitoria, Brazil. Over the last couple years, I have been fortunate to visit Brazil several times, setting up new collaborations and experiencing the amazing culture and natural beauty of Brazil. In that time, Alex and several members of his team have also spent several months working with us at USYD, while our very own Dr. Belinda Dechnik just completed her post doc working jointly between Brazil and USYD. Bravo Dani and Alex! And we look forward to the next suite of collaborative papers investigating this fascinating mixed siliciclastic-carbonate sedimentary system in Abrolhos. Post script to this blog: It is with a very heavy heart that I heard the news that our co-author and colleague Gilberto Amado-Filho recently passed away. Gilberto was one of the leaders of the research group working on the Abrolhos reef system and an amazing person. My condolences to his friends and family at this difficult time. ← University of Tokyo visits the School Geosciences!